Doing this blog I get to see a lot of books about cooking. Some are great, some a bit less. However, The Competent Cook by Lauren Braun Costello really stands out. It will hold an honored place on my book shelf between McGee and Julia for years to come. The author, Costello, is a veteran of the kitchen having founded Gotham Caterers in New York. Additionally she has worked as a private chef, recipe tester (The Joy of Cooking), a food stylist (The Early Show), and a culinary instructor. She holds a Grand Diploma in Culinary Arts with distinction from The French Culinary Institute in New York City. 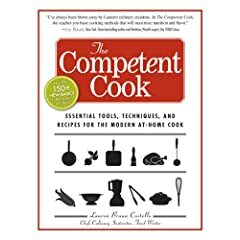 Like her popular column at CDKitchen.com, also entitled The Competent Cook, Costello’s book is way more than a collection of recipes. It is a how-to guide to setting up a functional kitchen from scratch. Which pots and pans to get, what utensils to buy, the whole nine yards. In fact, you won’t see the first recipe until page 108. The early chapters are instructions on the basics – kitchen organization, essential tools and techniques for everyday cooking, baking, grilling, health conscious, et al. There is even a chapter on how to shop and store food properly. For you recipe-mongers there are 150 new basics all modern cooks should have in their repertoire. There are four appendices as well including a way-better-than-average glossary and measurement conversions. The equipment materials appendix spells at the attributes and limitations of glass, cast iron, stainless and other cooking surfaces. The section on cooking with eggs is McGee-esque with its scientific explanation of every single way to cook an egg. The Competent Cook is perfect for the graduate just striking out on their own. It is also a terrific house-warming gift. And absolutely the best bridal shower present ever. EVER! Entry filed under: Food and Cooking, Food in Print. Tags: bridal shower, CDKitchen.com, French Culinary Institute, gift, Gotham Caterers, gradutation, harold mcgee, house, Julia Child, Lauren Braun Costello, The Competent Cook, The Joy of Cooking, warming. BBQ Styles – A Primer	Attack of the Killer Corn! Thanks, a for sure a successful gift! So important to go back to some basics, instead of thousand recipes executed in the wrong way!